This is a quick crafty project which looks really sweet neat or as irregular as it can go… little hands may need help with the cutting & sticking. 1. Fold & score your piece of card into the greetings card orientation which you would prefer and draw a circle where you would like the cut out window to be on the front. 2. Cut the circle window out and mark the centre point of the circle on the inner back of the card. 3. Cut a couple of strips of the paper and fold long ways with the decorative side on the inner of the fold. Wallpaper, sheet music or pages of an old book would all work great for this project. 4. Cut as many heart shapes out as you would like – to create the petals. Ensure that you cut out large hearts and smaller hearts for different petal sizes. 5. 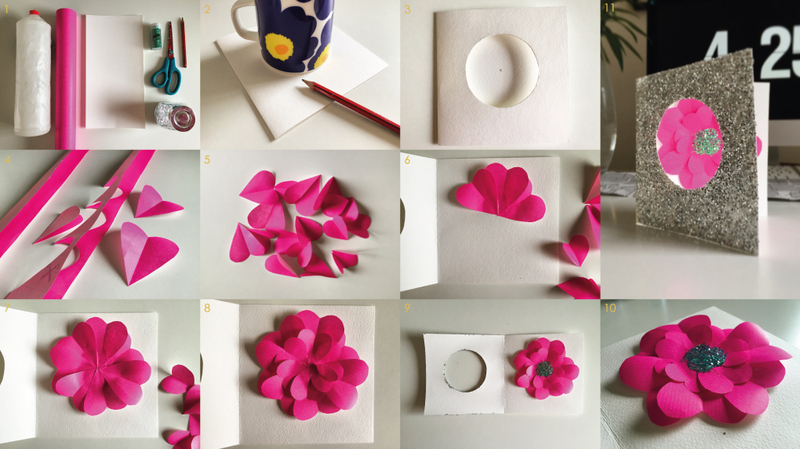 Use the previously marked centre point of the circle window as a guide for the centre of the flower, and begin sticking the larger heart petals to the card. Only glue the bottom half of the heart shape to allow the petal edge to be loose and 3 dimensional. 6. Continue all the way round overlapping the petals. 7. Add the smaller heart shape petals as a second layer, again only sticking down at the bottom half of the heart shape. 8. Dot a little dollop of glue in the centre of the flower shape and sprinkle on lots of the glitter. Allow to dry and shake the excess off. You could use other decorations instead of glitter.. buttons, beads, sequins etc..
9. Pretty! Mama’s gonna love it! 10. You can leave the front of the card plain or decorate it as you wish (I’m a total magpie so I covered the front in glue and piled on the glitter… couldn’t resist).